I've actually managed to do some baking in my dorm recently, namely a few dozen chocolate chip cookies and some shortbread, and it's really made me miss some of my baking staples. 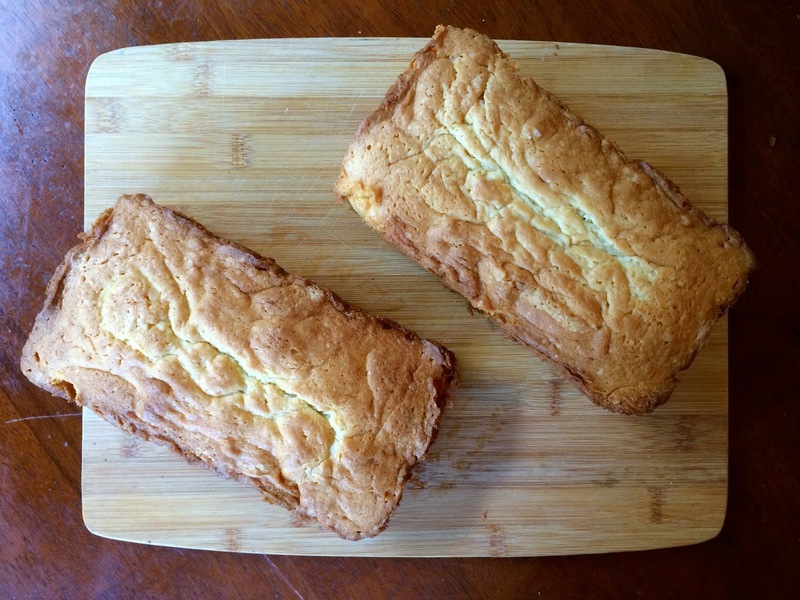 Get ready for a treat, y'all, because I'm sharing one of my favorite recipes of all time: poundcake. Mine is buttery, moist, and dense but not heavy, just as a poundcake should be. Poundcake supposedly got its name from the original list of ingredients: a pound of flour, a pound of sugar, a pound of butter, and a pound of eggs. My recipe is a little different, but I can assure you I'm not skimping on the butter. I'll start with the wet ingredients. As I said, there's plenty of butter. However, there is another secret ingredient. I'm a firm believer in that all cakes, muffins, and other baked goods with liquid batters (not doughs) should have buttermilk, cream cheese, and/or sour cream. They keep everything moist and promote a tender crumb, which is everything I want in a dessert. Here, I use cream cheese. I'm not really sure why I went with that over the other options, but I tried it and I was hooked. To make the batter, you have to beat the softened butter and softened cream cheese together until pale and fluffy. Poundcake is supposed to be pretty dense, but you don't want a brick for a cake and this also makes sure everything is fully incorporated. Next, you add a fairly frightening amount of sugar. Don't worry; this does make two very large loaves and I think once you decide to make a poundcake you have already given up on sticking to a diet. Once the sugar is incorporated, it's time for the eggs, five to be exact. Copious amounts of vanilla are added as well, followed by cake flour, baking powder, baking soda, and salt. Cake flour also keeps the cake from getting too heavy and dense, but if you don't have it, use 1/8 cornstarch and 7/8 all purpose flour. You can still use 100% all purpose flour as a last resort, but avoid it if you can. The method of baking the cake is pretty important too, namely what you bake it in. I've tried this in those cheap disposable aluminum pans as well as metal loaf pans, but the cake never comes out as well unless I use a ceramic or glass loaf pan. They act as insulators and cook the cake more slowly and with less direct heat to the batter. This results in a perfectly browned crust with a perfectly cooked inside as opposed to simultaneously burnt and raw. The cake also rises better, so I highly recommend investing in the right pan if you plan on making this a lot (which you will after you try it). I understand that poundcake is considered pretty vanilla in terms of dessert creativity. I still love it; it's a staple dessert, and sometimes simplicity is best. However, if you want to dress it up, there's plenty of ways to do so. This would be wonderful with some ice cream and caramel or chocolate sauce. You could make some sort of s'mores concoction with toasted marshmallows and chocolate sauce, too. If you want to change the actual cake, try switching it up with different extracts, like almond or coconut. A way to alter the whole cake is to make a cherry almond poundcake. It's pretty easy to do; just add 1 tsp almond extract with the vanilla and fold in 1/2 cup of dried cherries soaked in 2 T hot water at the end. This recipe is really easy to adapt to any taste or occasion, and I'm counting down the days until I can bake it again. Heat oven to 325F and line two loaf pans with foil. Sift the flour, baking powder, baking soda, and salt together. Whisk to blend. Beat the butter and cream cheese together until creamy, then gradually add the sugar. Add the eggs one at a time, then add the vanilla extract. Add the flour mixture. Spoon the batter into the prepared pans and bake for 40 minutes or until cooked through. For Cherry Almond Poundcake, use 1 tsp almond extract and 1 1/2 tsp vanilla instead of all vanilla extract. Add 1/2 cup of dried cherries soaked in 2 T hot water after folding in the flour.